This is one of those sandwiches that’s built for confusion, which makes it a perfect representative of today’s society. You bite and feel the tang of the rye pumpernickel– good, but flavored with something else. Ah yes, spiced yellow mustard takes over your attention. Then a kick of smoked herbs from pastrami step to the forefront. Turkey can barely compete with this epic mash-up of flavors, but it does come to the table. A calm sense of surrender appears with it, succumbing to the greater tastes, but noble in its presence. Distraction abounds. Text me, tweet this, forward that call to my cell phone. 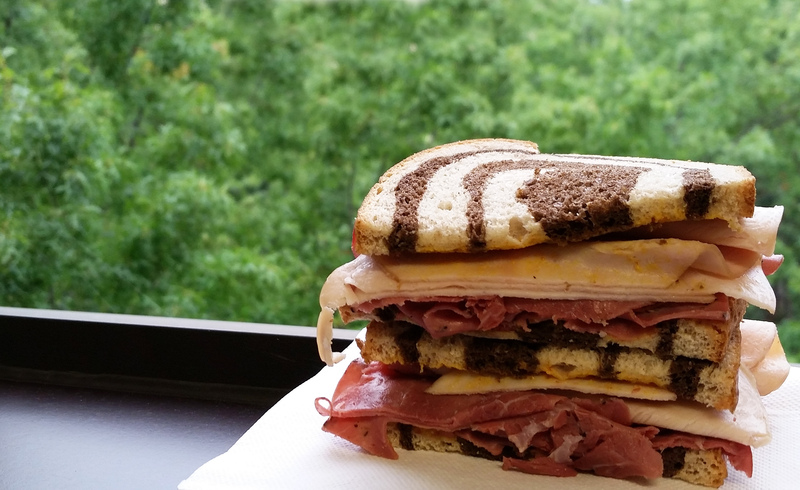 Take a break from the communication distraction and allow your mouth to contemplate the mysteries of this sandwich.